“Every grace that is communicated to this world has a threefold course. For by excellent order, it is dispensed from God to Christ, from Christ to the Virgin, from the Virgin to us." This devotion to Our Lady was inspired by the conversion story of Alphonse Ratisbonne which was featured on EWTN and also in the "Catholic Herald". Our prayer leaflet – Miracle of the Memorare – was first produced in April 2010 for parishioners in the parish of Our Lady of Ransom, St Gregory and St Agnes, Eastbourne, UK. The response to the devotion in our churches has been extraordinary with over 1000 leaflets and miraculous medals taken, and demand for these continues. It has helped to unite our community in petitionary prayer and extends to our housebound sick and disabled and many who have no direct contact with our parish prayer groups. We hope that you too will be inspired by the Ratisbonne story and the power of this beautiful prayer. 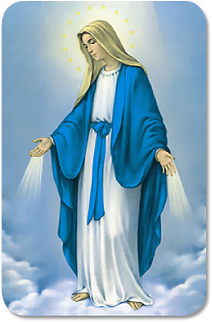 We ask you to join us in reciting it at least once a day and wearing the Miraculous Medal, requesting the intercession of our Blessed Mother Mary to help channel God’s bounteous graces to those we love and to encourage and strengthen them on their journey back to the faith. We also ask for your support in promoting this website to family, friends and fellow parishioners in order to extend this special devotion to Our Lady.